Breakfast is usually a veggie omelet, a smoothie, or a high fiber cereal with berries and milk or yogurt. In the winter months, I throw in steel cut oats to the mix. Typically, I choose 2 things to eat for breakfast each week. This week, it could be smoothies and omelets. Next week it could be cereal and yogurt. I then alternate between each of the 2 things throughout the week to change it up. Pictured left is an example of some cereals I may eat. If you are one of my clients, I have probably turned you on to eating Fiber One or Kellogg’s Bran Buds. I always keep one or the other in my cupboard to top off my yogurts or mix it in with other cereals. These cereals are packed with fiber (the highest I’ve seen in the market) and are super filling. Foods that are filling make you less likely to overeat at the next meal, thus promoting weight loss. Pictured is the Millville Shredded Wheat Blueberry flavor from ALDI. It has a clean label (no junky preservatives and additives that I can’t pronounce), whole grain is the first ingredient, and it contains 6 g of fiber/serving. 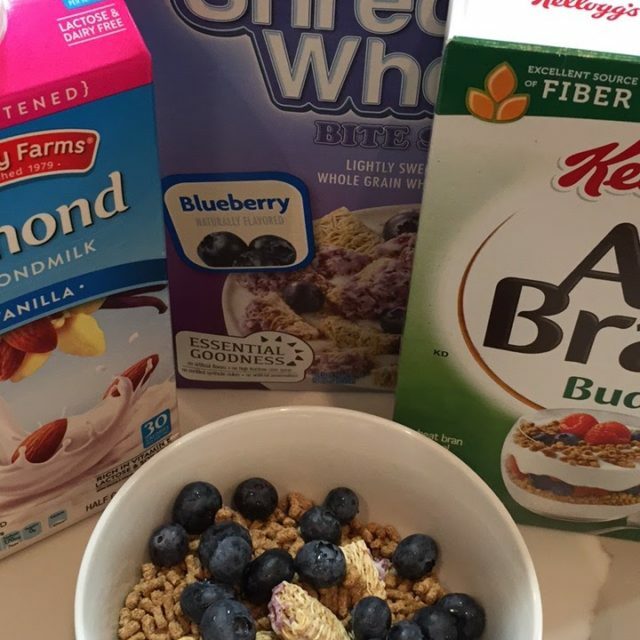 A balanced breakfast should have fiber plus a fat and/or protein. If you follow me on Instagram, then you have probably seen these posted on my story. I often post videos of what I am eating. I try to give people ideas of what a balanced diet is. It includes all types of foods and it doesn't have to be boring.